Get Smart! Epispde 52 | The Fringe | Conspiracy, News, Politics, and Fun Forum! Get Smart! Epispde 52 | The Fringe | Conspiracy, News, Politics, and Fun Forum! Get Smart! Epispde 52 The-Fringe | Your #1 Source For Conspiracy, News, Politics, and Fun! Meet the Clintons, and welcome to Mena AK! Look like youtube removed this video, here's another copy of it... it's pretty important stuff and ties into the Bush Regime's Narco Corruption. (11-24-2018, 10:59 PM)twitchy Wrote: If you can't get some of the links to work just look the URL up on the wayback machine circa 2008-2012 and it should pull them up. I apologize in advance for the wall of text but the original thread is being deleted piece by piece and I am having to rescue portions of it from the memory hole. I'm only on page 2 of the thread but so far it is a fascinating theory. Personally I have liked the theory of Dimiti Khalezov. Usually when I bring him into a discussion I get bombarded with Muh Judy What's Her Face. D. Khalezov claims that he has proof that an underground nuke was installed during construction for use later when the buildings had reached their expiration date. The existence of the nukes was on a need to know basis. Very few people knew about them. There's a link somewhere in this thread that goes into some detail concerning the various isotopes they found in the dust and debris that seem consistent with some type of nuclear detonation. Also, just briefly, it was being reported that an unidentified source at Pallisades Seismic Observatory stated that the readings from the collapse of WTC 1 and 2 were consistent with the detonation of underground nuclear devices... I wish they had named their source there as they would later officially change their story. Dr. Judy Woods is the lady you're talking about... I've read her stuff but I just don't know enough about these alleged dew weapons to really form an opinion on them in this context at least. She did document some strange things so her research is valuable in that regard but alot of that could just as easily be explained by nuclear detonations and the clean up and decontamination procedures were consistent with radiological material handling. I'm glad you are enjoying the thread, it's not all of the research I have but recreating the information after all this time is challenging particular in terms of sourcing the material as a great deal of it has been scrubbed from the internet. It seems logical that after the botched bombing in 1993, the desperate radicals used every trick they could think of. They had to put off their sinister plans until 2001 while they got everything in place. No third chances. If the original plan was to spark the detonation of the explosive laced concrete and pull the switch on the underground nukes, something went wrong. Plan B might have been thermite on the columns. That would explain the confusing evidence of all three methods to bring the towers down. Dimitri Khalezov brings out in his book http://www.911thology.com/ that part of the permit process of large skyscrapers is a detailed plan for future demolition. At the time of the WTC construction both the US and the USSR were using limited yield underground nukes for peaceful reasons. The USSR used them for hollowing out underground caverns in solid rock as storage facilities. 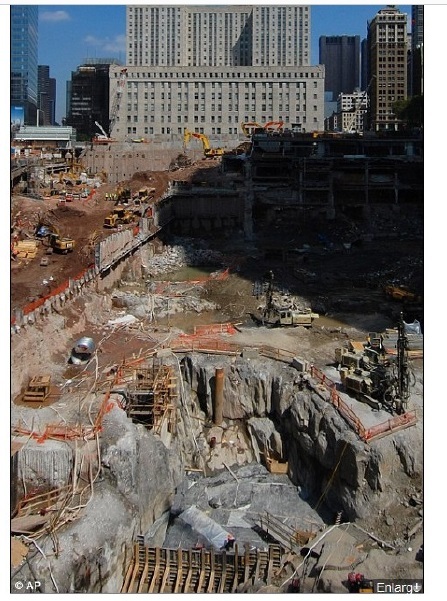 I used to have a picture of the cavern at the bottom of the WTC after all the debris was hauled away. The sides of the cavern are melted granite. I have changed computers several times so finding those pics will be difficult. 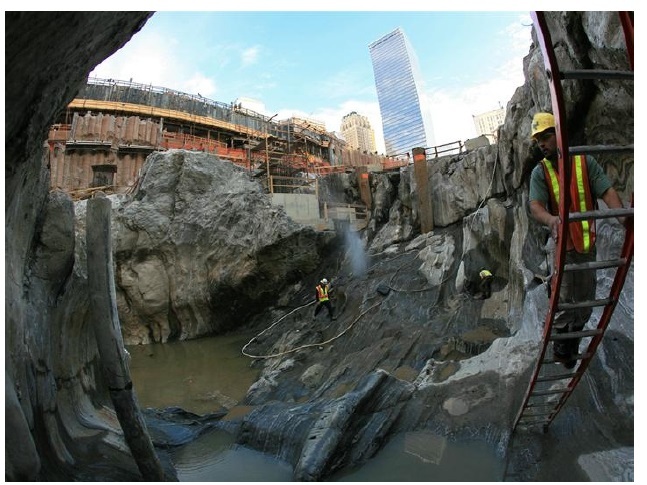 40 ft deep pot hole under the WTC that they didn't know was there. They claim it was carved by a glacier. (01-23-2019, 03:37 PM)SlowLoris Wrote: 40 ft deep pot hole under the WTC that they didn't know was there. They claim it was carved by a glacier. That's fascinating. Claiming they didn't know it was there is patently ridiculous, there's a huge difference between erosion and vitrification too bad we can't get someone to take a closer look at this 'pot hole' for us. Thanks for posting this. Just for fun. The following video is a computer simulation that does not take into account the fact that no matter how fast an aluminum can is shot out of a rocket launcher it will not damage a Abrams tank. (01-25-2019, 04:25 PM)SlowLoris Wrote: Just for fun. The following video is a computer simulation that does not take into account the fact that no matter how fast an aluminum can is shot out of a rocket launcher it will not damage a Abrams tank. I wish I could find the article, but there was actually a program that was looking into the feasibility of making missiles that resembled civilian airliners and there was also a US senator that had a couple of these things on a military base somewhere in the south... anybody remember that one? It took about 16 years, but we are finally starting to see some vindication at least in terms of the collapse of WTC 7. The findings will add fuel to conspiracy theories which suggest the twin towers and WTC 7 were blown up. Some have even blamed the US Government which they say wanted to provide the grounds for military strikes in the Middle East. Historically, skyscrapers have resisted collapse after fires. A skyscraper in Philadelphia burned for 18 hours in 1991 and a high-rise in Madrid in 2005 each remained standing following fires. There is no evidence of death in Tower 7 - located around 100 metres from the Twin Towers. Quote: "Well it wasn't architectural defect... you know the World Trade Center was always known as a very very strong building. Don't forget that took a big bomb to the basement. Now the basement is a very vulnerable place because that's your foundation and it withstood that. The building was standing solid and half of the columns were blown out. This was an unbelievably powerful building. I happen to think that they had not only a plane but they had bombs that exploded almost simultaneously because I just can't imagine anything being able to go through that wall." Another often overlooked aspect of the events of that day was the mysterious explosion captured and broadcast by CNN at 9:04am. A few seconds after the impact of the second tower, there was a huge explosion in the area between the North Tower, WTC 1, and WTC 7, an area commonly known as WTC 6. That explosion would gut even the basement levels of the building and leave a massive crater about eighty foot deep in the center of the building. This happened before either of the towers collapsed, and it was broadcast live on television. Assuming of course that no Jet Fuel ran down the elevator shafts of the towers and walked across to WTC 6 to cause this massive explosion, what would explain that event? 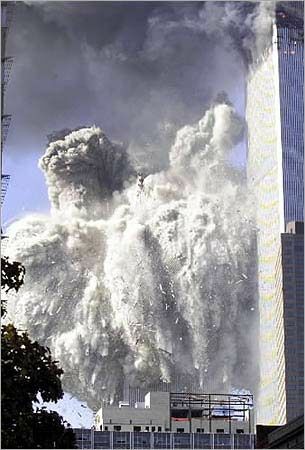 Get a real good hard look at that crater... that explosion happened before either WTC 1&2 towers collapsed. Looks alot like the remnants of another job CDI worked on a few years before in Oklahoma, no? Notice the huge crater? Keeping in mind that all that debris from the collapse of WTC 1 hit the area immediately around this crater, it didn't manage to dig an eighty foot EMPTY round hole into the rest of the area. Falling steel doesn't excavate 80 foot craters and then leave them empty and near symmetrical. Large explosions ejecting building material upwards and outwards can though, and it's hard to debunk an empty crater especially since the actual explosion was caught on CNN's live broadcast and widely reported before the collapses overtook the narrative. I watched CNN live the morning it happened, and I remember seeing the plume, but not what time this footage was broadcast. 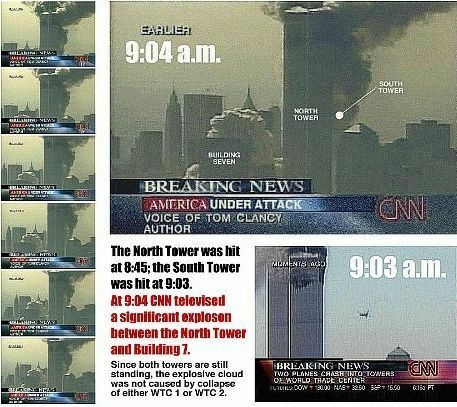 From what I've read however, CNN confirmed the time of that footage was just after the second impact just as the caption says... but some have incorrectly stated that it was during the actual collapse of WTC 2. 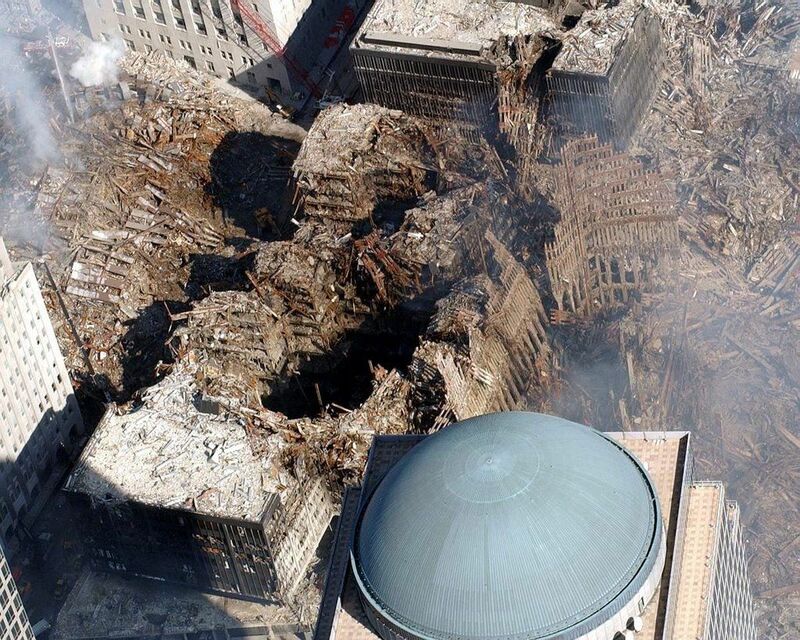 Well let's look a little better at the picture then, and ask ourselves how do you reckon CNN's angle on this shot managed to hide the entire left side of this event going on behind WTC 1 ? The huge dust cloud you see in the first pic is undeniably coming from the area of WTC 5 and WTC 6, not WTC 2, and it is clearly an explosion, and it was reported as 'some kind of explosion'. 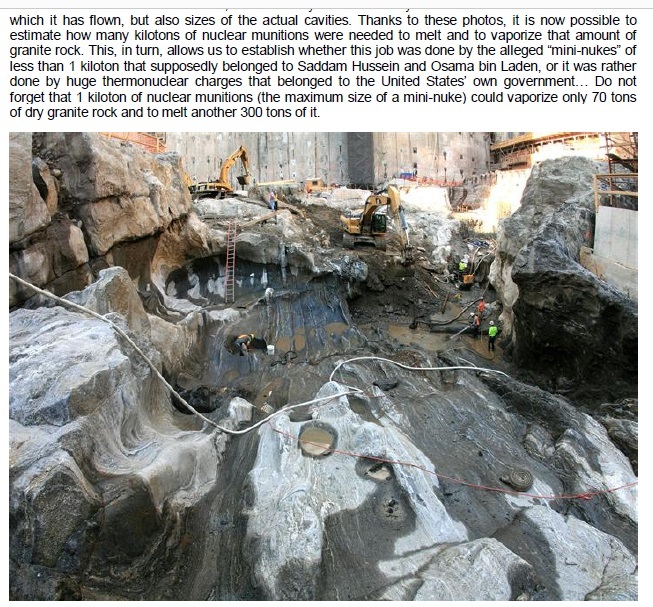 What's the Official Story's take on the blast craters found in WTC 5 and WTC 6, and where did all the material from the eight floors of WTC 6 go? Where did all the falling debris that supposedly punched this round vertical hole go? It's an empty crater. 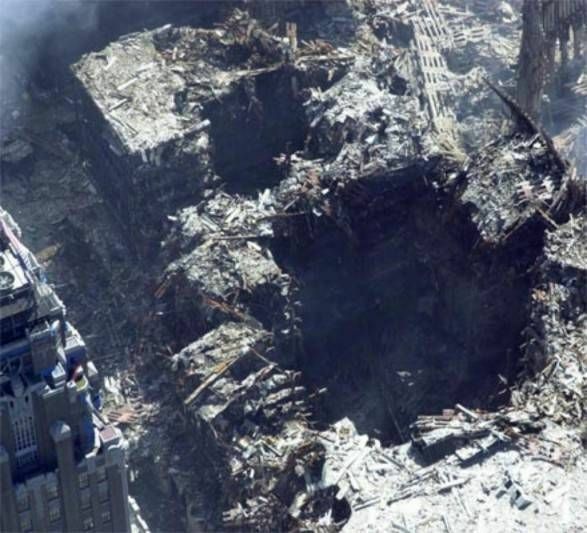 If massive of piles of falling steel and debris caused these holes in WTC 5 and WTC 6, why isn't there massive piles of steel and debris on the remainder of the rooftops of these buildings and why are these craters instead of rubble piles? We need to take another look at the extensive improvements and inspections done to the WTC complex by Turner Construction Company prior to 9-11, how their company's president rose to the high position of Mayor of a major US city, and how they might have had unique access to Navy Seal Demolitions Equipment... or we might go into the whole Kroll, John O'Neil, Jerome Hauer thing, or maybe even into the intelligence operations conducted at various flight schools that go all the way back from Oswald and JFK up Mena AK and Iran Contra to Mohamed Atta. Even with the destruction of physical evidence, this case is still solvable IMO.